Humans aren’t the only creatures who feel romantic around Valentine’s Day. Skunks do, too. You’ve probably noticed lots of dead skunks on roads and highways over the past couple of weeks. Part of the reason is obvious. Skunks are nocturnal, so drivers often don’t spot them until it’s too late. And skunks have such poor eyesight that they can’t see much further than ten feet beyond the tip of their noses. But they get run over more often in February and March because it’s mating season. Though they’re not true hibernators, skunks have been hanging out in their dens for the past few months. Males den alone but females often share winter quarters with up to a dozen other females. As the days grow longer and warmer, skunks emerge from their dens and begin moving about in search of food. And love. Adult males are especially active this time of year and will travel widely in search of receptive mates. Skunks are polygynous, meaning that successful males will mate with more than one female. Male skunks may fight aggressively over a female but they don’t use their spray as a weapon during these encounters. It’s the girl skunks who stink things up. When approached by a suitor she finds unacceptable, a female will spray her odiferous scent to run him off. That’s likely what you’re smelling when you wander outside on an early spring evening. Eventually, most female skunks find a fellow they like. A couple of months after mating, a female will excavate a maternal den, separate from the one where she spent the winter, and line it with dried grass. Soon, she’ll give birth to a litter of two to ten kits. Male skunks play no part in raising the young. When born, baby skunks are blind, deaf and covered in a soft layer of fur. Their eyes open at three weeks of age. Though they’re weaned when about two months old, adolescent skunks generally stay with their mother until they themselves are ready to mate, usually at about one year of age. And the cycle begins all over again. 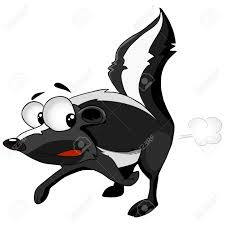 It’s no secret that skunks spray their unmistakable musk when angry, frightened or injured. But did you know that humans can smell skunk musk down to ten parts per billion? That’s like saying that if you had a billion marbles all mixed up and only ten of them were soaked with skunk smell, you’d still be able to smell skunk. The scent can be detected by a human nose at more than three miles away. Amazing, huh? Though unsurprising to those of us who’ve ever hit a skunk with our car. Though skunks can live up to ten years in captivity, most only live a year or two in the wild. Which all goes to show that looking for love is risky business.